Rae Mahaffey explores color, pattern and perspective to describe elements in the world around us. She paints abstractly, expressing visual experiences and the subconscious through formal artistic means. 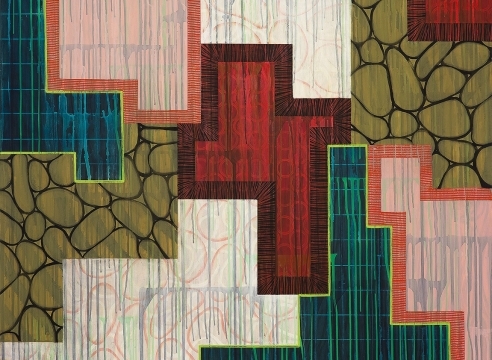 Juxtaposing forms in unexpected ways, Mahaffey’s spatial compositions are playful and modern. The current paintings and glass works were made in studios both in Portland and at the Oregon Coast, and as a result have color ranges that respond to the settings in which they were made. This exhibition, titled Eclaboussure, references a traditionally Surrealist technique of painting, in which oil paints or watercolors are laid down and water or turpentine is splattered, then soaked up, to reveal random splatters or dots where the media was removed. Mahaffey began exploring this technique in her studio, and was intrigued to discover it had been embraced by and identified with the Surrealists, with whom she has always had an affinity. The chance results are enticing and visually rewarding. Mahaffey’s fresh, direct approach is thought provoking, visceral and contemporary. Rae Mahaffey studied at the University of Copenhagen, Denmark and the University of Washington. She moved from Seattle to Los Angeles in l988 where she worked as a curator for Gemini G.E.L. and as a consultant for David Hockney's studio. She moved to Portland in 1992 to start Mahaffey Fine Art print studio with her husband Mark. Mahaffey’s exhibitions include shows at the Portland Art Museum, OR, Marylhurst Art Gym, OR, Maryhill Museum, WA, and the Schomburg Gallery in Santa Monica. She has completed commissions through the Washington State Arts Commission for Gray Middle School, in Tacoma and Columbia Basin College in Pasco, WA, a project for the Pacific First Center, Harsch Investment Properties, in Portland, and the Tigard Public Library in Tigard, OR, and most recently, and major installation for the El Paso Airport in Texas.